Marcus Howard played at Georgia as a linebacker and defensive end. The tweener had his best year as a Senior, with 10.5 sacks, 3 forced fumbles, and 41 tackles. He saved his best game for last, earning Sugar Bowl MVP Honors in 2008, with 3.5 sacks and a forced fumble that he scored on, during the Bulldogs 41-10 thrashing of the Hawaii Rainbow Warriors. Howard was drafted in the 5th round of the 2008 NFL Draft by the Indianapolis Colts. He played in 9 games and finished his rookie year with 14 tackles, 1.5 sacks, and a forced fumble. With a new head coach in Jim Caldwell for 2009, the team decided to go in another direction with the defense. 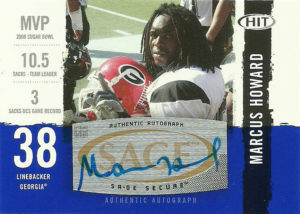 Marcus was cut but found a home with the Tennessee Titans in 2010- a team he spent the season on an off the roster for. In 2011, Marcus signed with the Edmonton Eskimos of the CFL where he finally was able to see significant playing time on the field. During his rookie season in the league he posted 11 sacks and 2 forced fumbles. He played for the Eskimos through 2017 and has 36 career sacks and 5 forced fumbles.